About Us: Beryhome is a textile manufacturer with 20 years of experiences in producing and commercializing home textiles and ready-made curtains and roller shades to North American and European markets. Our manufacturing process follows strictly the ISO 9001, and Sedex responsible business process. Our products are certified as high quality products by SGS, BSCI, and TUV Heinland and Bureau Veritas every year. We aim to offer our customers a variety of latest design of curtains blinds. We always keep an eye on the latest trends in curtains & blinds and put our customer's wishes first. That is why we have satisfied customers all over North America and Europe. The interests of our customers are always the top priority for us, so we hope you will enjoy our products as much as we enjoy making them available to you. Notes: Our product pictures shot by professional photographer. However, due to differences in computer monitors display, there might be color variations between the actual product and your screen. For video instruction on how to install this shades, please visit our Youtube channel by searching "Beryhome" or visit this Youtube link: https://youtu.be/PTd69gcvwvM . All mounting hardware and child safe cord-lock device come around. Our roller pipe is about 0.2'' inches wider than the shades in order to avoid the wrinkle in each end of the blinds. Ideal for bedroom, living room, office, Kitchen and other window decorations. Size: Width 25''x Height 68'' inches. Color: Black. Quality Fabric: Our fabric is strictly inspected and selected according to the industry standard: SGS, AQL 4.0 system before production. This roller shade/blind made with high quality of polyester fabric. Modern Design: Beautiful and solid colors match with all type of house/office/hotel window decorations. 20 colors available. 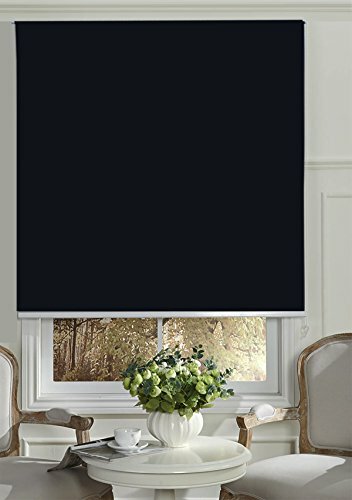 Multi-Functions: This roller shade/blind not only darkens your room from UV rays and light, reducing noise from outside but also bring contemporary style to your home, which make your home truly blissful and relaxing. Our recommendation for Installation: 1). For an inside window mount: Measure the width from left to right of the inside edge of the window frame. Reduce the width by 0.2'' inches in both sides to allow a smooth installation. 2). For an outside window mount: Measure the width from left to right of the window frame, and increase the width 2.76''inches (7 cm) in both sides in order to cover the whole window. If you have any questions about this product by Beryhome, contact us by completing and submitting the form below. If you are looking for a specif part number, please include it with your message.